The 2-star Country View Resort Phang Nga offers comfort and convenience whether you're on business or holiday in Phang Nga. The hotel offers a high standard of service and amenities to suit the individual needs of all travelers. Free Wi-Fi in all rooms, daily housekeeping, ticket service, Wi-Fi in public areas, car park are there for guest's enjoyment. All rooms are designed and decorated to make guests feel right at home, and some rooms come with towels, television LCD/plasma screen, umbrella, air conditioning, desk. The hotel's peaceful atmosphere extends to its recreational facilities which include fitness center, golf course (within 3 km), horse riding, garden. 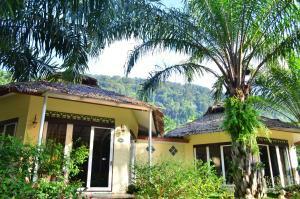 Discover all Phang Nga has to offer by making Country View Resort Phang Nga your base.